Hornig and her family fled Nazi Germany and settled in the United States in 1933. She went to college, and got married. In about 1944, Hornig’s husband Donald, a chemist and explosives expert, was recruited for an important team for World War II: as a scientist on the Manhattan Project, which developed the atomic bomb. Lilli went along, and was offered a job too — as a secretary for the scientists. Mrs. Hornig didn’t know how to type, but she was an accomplished chemist herself, with a bachelor’s degree from Bryn Mawr and a master’s from Harvard. She was also hired as a staff scientist, where she worked on the trigger for the bomb. On its first test on 16 July 1945, she described the nuclear explosion as “boiling clouds and color — vivid colors like violet, purple, orange, yellow, red.” After seeing its power, she was among many scientists who signed a petition asking that the bomb be demonstrated on a deserted island, rather than used on a Japanese city, hoping Japanese leaders would understand its power and surrender. “But big boys like big toys,” she said years later. “I don’t think the Army even considered that request.” Japan did not, in fact, surrender after the first bomb was dropped on Hiroshima less than a month later. But after the second strike, on Nagasaki 3 days later, they did surrender, ending World War II; Germany had surrendered on 8 May 1945. 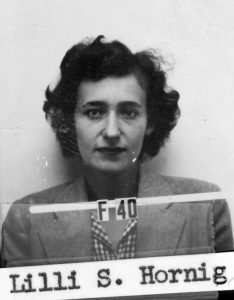 Hornig’s ID badge photo at Los Alamos. After the war, Hornig returned to Harvard and obtained her Ph.D., and became chair of the chemistry department at Trinity College, now Trinity Washington University, and advocated for more opportunities for women scientists, serving on equal opportunity committees for the National Science Foundation, the National Cancer Institute, and the American Association for the Advancement of Science. In the 1960s, Hornig and her husband were recruited as a team as science advisers to President John F. Kennedy. Under President Lyndon B. Johnson, Lilli Hornig helped to found the Korea Institute for Science and Technology. Dr. Donald Hornig died in 2013, at 92. 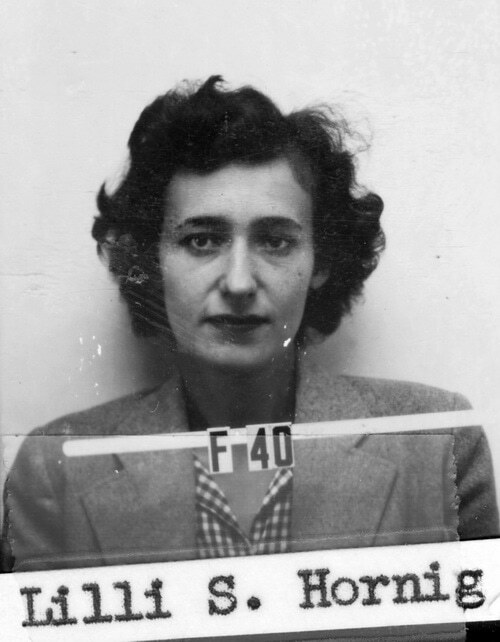 Dr. Lilli Hornig, one of only about a dozen surviving scientists from the Manhattan Project, the Atomic Heritage Foundation says, died November 17, from heart and lung failure. She was 96.